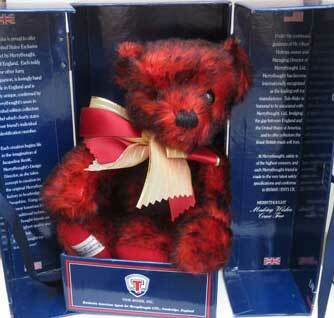 Established in 1930, this English Teddy Bear Maker is still a family business in Ironbridge, Shropshire, England. 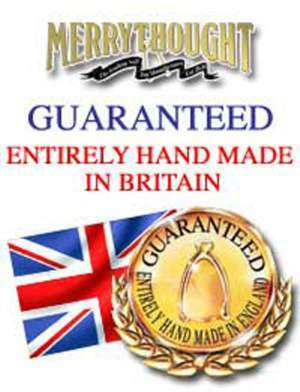 Merrythought is one of the oldest and most prestigious of England's toy manufacturers. The magic of Merrythought has continued to delight adults and children with traditionally hand-crafted toys that are a joy forever - treasured family friends that are passed down from generation to generation - valued heirlooms that give year after year of lasting pleasure. Founded in 1930 by Mr W Gordon Holmes, Merrythought exports to some of the world's most exclusive stores. Collected for generations by the British Royals you will find discerning Merrythought customers and collectors in almost every country in the world. Merrythought's history provides a fascinating insight into early 20th Century England - a period of considerable industrial change and development. The company's story actually begins in 1919 when Mr Holmes went into partnership with a Mr G H Laxton to open a small spinning mill in Yorkshire specialising in the manufacture of mohair yarn from imported raw materials. The introduction of synthetic fibres in the Twenties led to a decline in the demand for mohair fabric causing one of their yarn customers, Dyson Hall & Co. Ltd. of Huddersfield to lose a considerable amount of business. Holmes and Laxton decided to buy Dyson Hall's plush weaving company and set about finding new ways to utilise the production of their luxurious mohair yarns. An introduction to two men working in the soft toy industry - Mr. C J Rendle (production manager at Chad Valley) and Mr A C Janisch (sales manager for J K Farnell) - convinced Holmes and Laxton that they should open a factory in Shropshire. By September 1930 an exciting new company called Merrythought had begun to produce toys in the former social room of the Coalbrookdale Co. Over the years the original Merrythought factory site at Coalbrookdale (purchased from the owners in 1956) has seen considerable improvement. New buildings have been added, but the large brick building built by the iron foundry in 1898 is still used today to lovingly create each and every Merrythought toy. One of the former Chad Valley employees who came to work at Merrythought was a remarkable lady called Florence Atwood. A deaf mute, Florence had studied design at the 'Deaf and Dumb School' in Manchester which she attended with Mr Rendle's daughter. She created her own toys, translated drawings by well known artists including MGM studios' Jerry Mouse and single-handedly designed the entire range of 32 toy patterns for the first Merrythought line in 1930. 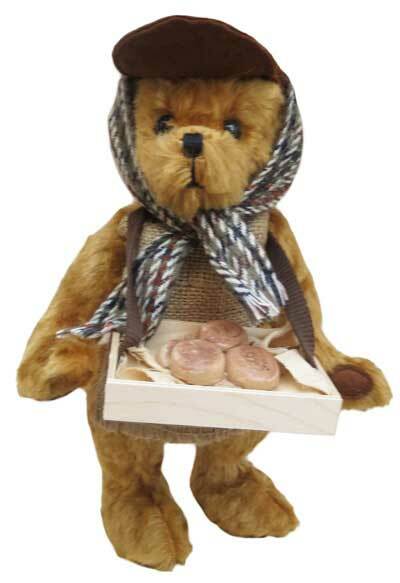 The first company catalogue was produced in 1931 and featured the much loved Greyfriars Bobby and the company's now famous line of teddy bears beginning with The Magnet Bear. Florence's second catalogue in 1932 expanded the range to include other domestic animals like The Black Cat, farm animals, jungle animals, wild animals, animals on wheels and even dressed animals like 'Toby' - a movie toy that could be placed in different positions and hold them. 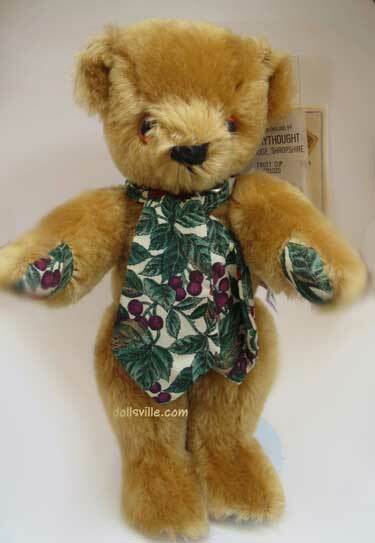 Until her death in 1949 Florence Atwood was the chief designer for Merrythought. Some of her characters remain as popular today as ever and are still produced using the original patterns. By 1939 over 200 people worked at Merrythought, but on September 1 1939 Germany invaded Poland and World War ll began. The British Admiralty took over the Coalbrookdale factory buildings and used them for vital map making work. Merrythought rented space in nearby Wellington and at the Government's request began to produce items for the war - chevrons (sleeve badges), linings for helmets, tiny ignitor bags, gas mask bags, covers for hot water bottles and a variety of practical products made from gabardine and velour. In March 1946 Merrythought was able to restart production at Coalbrookdale. Mr B Trayton Holmes, son of one of the founders, came to the factory and under his management Merrythought began to expand again. An automatic stuffing machine was brought over from America in 1955 - although it did not entirely replace the hand stuffing which still continues to this day - and the original foundry building was improved again with a new design and showroom building and an office block built in the grounds. 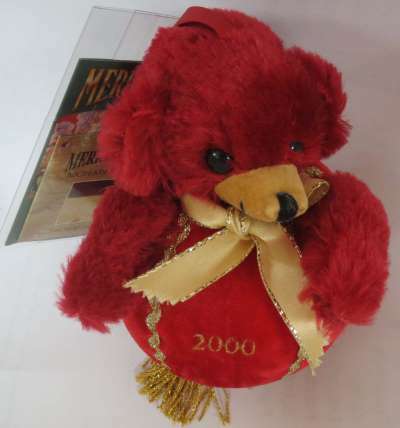 There is nothing mass produced about a Merrythought toy. Modern production methods combine with traditional craft work to produce each unique toy - so no two examples of any design are ever exactly the same. They strive to make our collectibles more interesting. They still use old skills and traditional techniques and say they never compromise in the production of any toy bearing the Merrythought label. 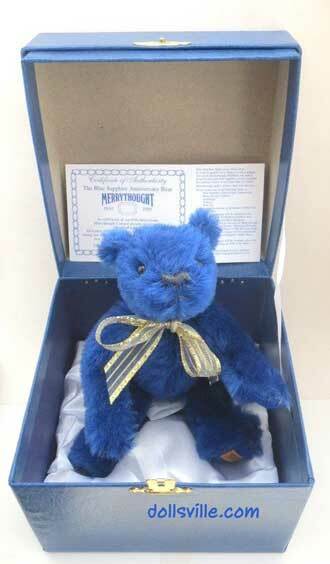 Merrythought's limited edition teddy bears were created to meet an increasing demand for collectable Bears. Some of these delightful mementoes commemorate a variety of famous occasions and are highly prized by collectors all over the world. 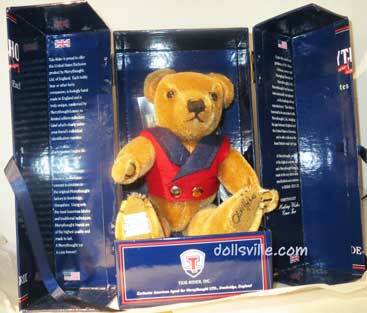 Their carefully crafted replicas include historic figures. 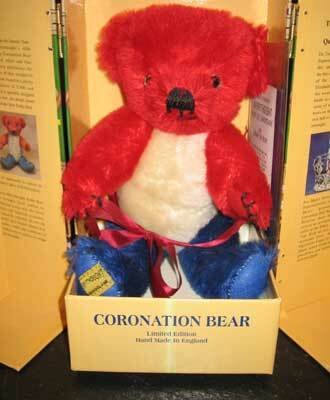 In 1993 the company celebrated the 40th anniversary of two momentous achievements by introducing - The Mount Everest Bear (personally commissioned by Sir Edmund Hillary to mark his successful ascent of Everest) and The Coronation Bear (a patriotic little fellow based on the original 1953 model featured in Pauline Cockerill's 'The Ultimate Teddy Bear Book'). Today the award-winning manufacturers produce an ever-increasing range of delightful pieces. Throughout its impressive history the company has remained a family business. 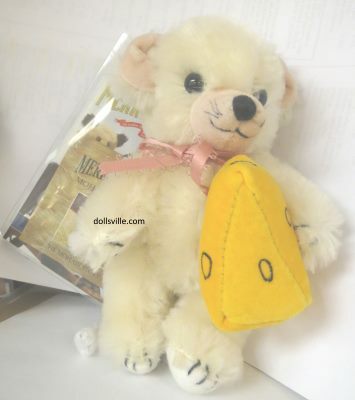 Only the best in top quality soft toys can bear the prestigious Merrythought wishbone label. By the way .... everyone knows that a wishbone is said to bring good luck and make your favourite wish come true. But if you've ever wondered about its significance as part of the company's trademark then we have the answer. The word 'Merrythought' is actually the old English name for a bird's wishbone - and Merrythought always hope that owning one of their toys will truly be a wish come true for you.